Al Qaeda appears to have had enough of one of its affiliates fighting in Syria: the Islamic State in Iraq and the Levant. The group has been locked in conflict with other Islamist factions and gained a grim reputation for abuses in parts of Syria it controls, including summary executions and mass killings. A statement posted on jihadist forums Sunday and purportedly issued by al Qaeda's General Command said "it has no connection with the group" and blamed it for "the enormity of the disaster that afflicted the Jihad in Syria." The al Qaeda statement, translated by the SITE Intelligence Group, follows more than a month of intense factional fighting between the Islamic State in Iraq and the Levant with other Islamist groups in northern and eastern Syria. 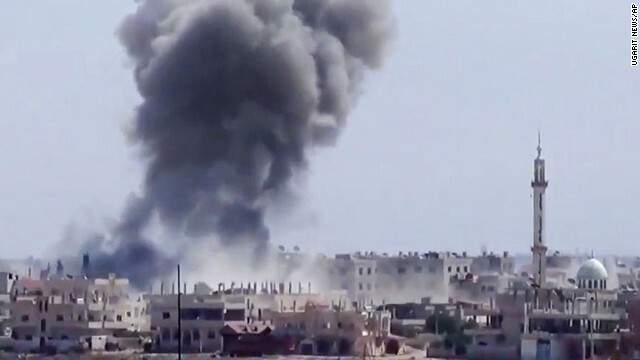 The Syrian Observatory of Human Rights says it has documented 1,747 people killed in the past four weeks alone but suspects that the real number is substantially higher. In recent days, the Islamic State has targeted senior figures in other groups. On Sunday, two senior rebel leaders were killed near Aleppo - along with 14 others - when an Islamic State member who was supposedly conducting truce negotiations with them blew himself up, according to the Observatory. The previous day, Islamic State fighters assassinated Abu Hussein al Dik, a senior commander in the powerful Suqour al Sham brigade, near the city of Hama. The real enemy is Apartheid Israel. It may be better all the way around to just cede to the ISIS a part of eastern Syria along with western Iraq so that they can set up their own home state in the Middle East. Hopefully, the ISIS may agree to leave the neighboring countries in peace. Most of all, the U.S., along with Britain and France need to stop interfering in this part of the world where they brought only grief and suffering. Yes. France and Britain should leave them alone. These Muslims are doing a good job killing other Muslims. Muslim brutal dictator vs. Muslim terrorists. This Muslim vs. Muslim game is more serious than Super Bowl. Not even AQ can stall the killing once it is catalyzed.